After the breakfast we will leave passing the villages recuay ,conococha ,llamac and finaly Cuartelhuain place where our donkey driver will be waiting for us ready for next day. Day 2: cuartelhuain – Cacanan pass 4,750m. – Mitucocha 4,100m. After the breakfast In the morning we cross our first pass Punta Cacanan (4700m) then descend to our camp at the beautiful lake Laguna Mitucocha (4220m). 6 hours. From our camp we have close views of the huge peaks Ronday, Jirishanca, Ninashanca. We cross the pass Paso de Carhuac (4650m) then descend to our camp at the big lake Laguna Carhuacocha (4150m) 6 hours. 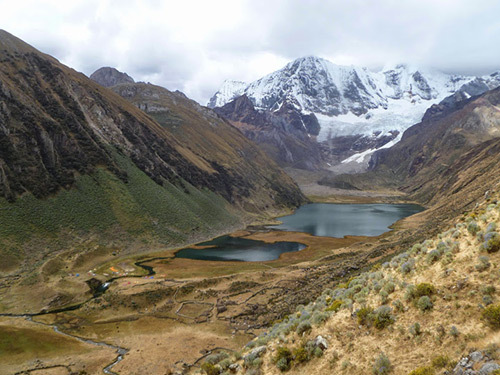 From our camp we look directly up the lake to the peaks and ice fields of Siula and the two peaks of Yerupajá. We climb to the pass Portachuelo de Huayhuash (4750m) from where you look across to the Cordillera Raura and the snow topped peak Leon Huacanan. 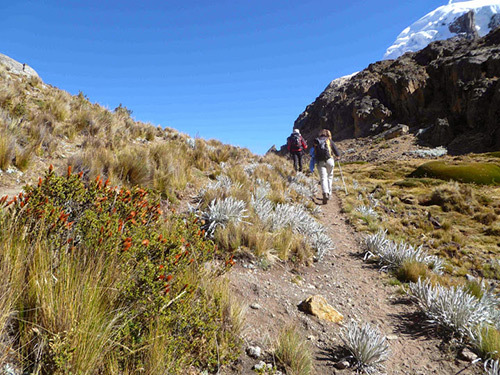 We skirt around the large lake Laguna Viconga before walking up the valley ½ hour to set up camp (4480m) 6½ hours. There are some hot springs near Viconga ? maybe have a hot bath!. Day 6: viconga –cuyoc pass 5,000m. – Huanacpatay 4,150m. We cross our highest pass Punta Cuyoc (5000m) then descend to the valley Quebrada Huanacpatay where we have an easy walk down the valley to our camp (4300m) 6 hours. Day 7: Huanacpatay – Huayllapa village – Huatiac 4.350m. Day 8: Huatiac – Tapush pass 4,800m. 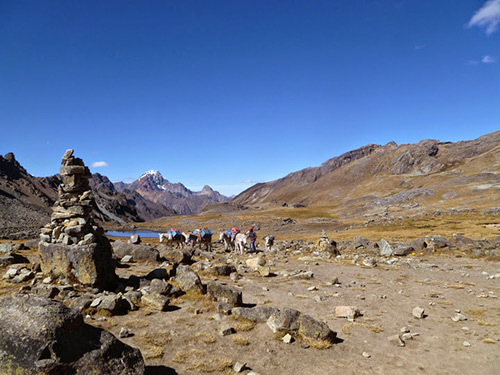 – Yaucha pass 4,800m. – Jahuacocha 4,100m. tough day as we cross two passes today. 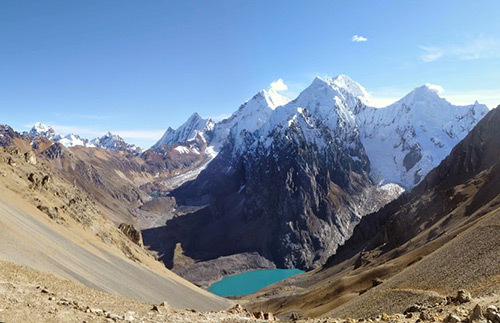 First we climb to the Pass Punta Tapush 4750m, then pass by Laguna Susucocha before climbing again to Punta Yaucha (4800m). During the descentwe will see the peaks of Rondoy, Jirishanca, Yerupajá, Rasac and Sacra come into view. Camp at the beautiful Laguna Jahuacocha (4100m) 8 hours. Day 9: Jahuacocha rest day or visit Cerro Amarrillo. early start. We leave early, starting with a gradual climb to our final pass Pampa Llamac (4300m) from where we have our final views of the Huayhuash range. Then it is a long descent back to Llamac. 5 ½ hours. In Llamac the bus will be waiting to take us back to Huaraz for hot showers! !